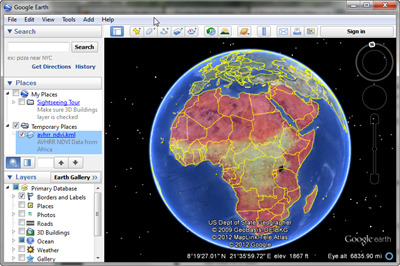 This program creates a KML file that can be opened in Google Earth to display the image drapped over the Google Earth terrain. A corresponding image file is also produced. The KML and image file must be in the same directory to use them with Google Earth. A 2D image or a 24-bit image with or without an alpha channel. If an alpha channel is present, it will be modified by the program if the Transparent keyword is used. An image is required unless the GeoTiff keyword is used to obtain an image. A map coordinate object (cgMap) from which map projection information and map boundaries for the image overlay can be obtained. This parameter is required unless the GeoTiff keyword is used to obtain a map coordinate object. If this keyword contains a cgKML_File object, the image is added to the file as a <GroundOverlay) element and a separate KML file is not created. In other words, the Filename keyword is ignored and the image file created takes its name from the cgKML_File object. The index number of a color table. The Brewer and Reverse keywords will be checked to see how to load the color table into the Palette keyword. This keyword will take precidence over any colors that are loaded with the Palette keyword. This keyword applies only to 2D images. A string that is used to describe the image in the Google Earth interface. The drawing order of image overlay. The first order is 0. Images with a higher order are drawn on top of images with a lower order. The name of a GeoTiff file from which the image, mapcoord, palette (possibly), and latlonbox values can be obtained. The name of the KML file that will be created. The image file will have the same name, but with a *.png file extension. The KML file and the image file will be created in the same directory. A three-element array that gives the coordinates [longitude, latitude, elevation] where the "eye" should be located with respect to the Earth. This implements a LookAt element in KML file, so that when the KML file is open, it "flies to" the location represented here. Longitude must be in the range -180 to 180. Latitude must be in the range -90 to 90. And elevation is a number in kilometers. If a two-element array [longitude, latitude] is passed in, the default value for elevation is 11000 km above the surface of the Earth. Set this keyword to move the KML file and support files to a KMZ compressed file. Note that this capability is ONLY available in versions of IDL starting with version 8.0. A four-element array giving the boundaries of the map projection in the Google Map form of [north, south, east, west]. Normally, this information is obtained from the mapCoord object and need not be passed in. The values are in latitude and longitude coordinates that go from -90 to 90 and -180 to 180 degrees, respectively. The value to use for the MAX value when the image is scaled with BYTSCL. The value to use for the MIN value when the image is scaled with BYTSCL. The "color" of a pixel that will be treated as a "missing" color or value. Any pixels in the image with this color value will be set completely transparent. If Color is a string, use cgColor to obtain a color triple. If Color is a non-strint scalar, this value is taken to be the missing color index in a 2D image. Otherwise, this is assumed to be a color triple that indicates the "missing" color or value in the output image. The alpha channel in the output image is set to 0 for the "missing" color, which makes this value completely transparent. If the Transparent keyword is not used, it is set to 0 by using the Missing_Value keyword. This is the <name> element in a Feature object. It is user-defined text that is used as the label for an object in Google Earth. Setting this keyword to a value allows the user to resize the image prior to making the PNG image file that will be output with the KML file. This is especially helpful with very large images. Setting the factor to 0.5 will reduce the image to half it's normal size before processing. Setting the factor to 2.0 will increase the size by a factor of 2 before processing. The image is resized with nearest neighbor sampling. ;; Download the image file from the Coyote web page. netObject = Obj_New('IDLnetURL') url = 'http://www.idlcoyote.com/data/AF03sep15b.n16-VIg.tif' returnName = netObject -> Get(URL=url, FILENAME='AF03sep15b.n16-VIg.tif') Obj_Destroy, netObject ;; Create the image overlay KML file. cgImage2KML, GeoTiff='AF03sep15b.n16-VIg.tif', Min_Value=0, CTIndex=11, $ /Brewer, /Reverse, Transparent=50, Filename='avhrr_ndvi.kml', $ Description='AVHRR NDVI Data from Africa' ;; Start Google Earth and open the KML file you just created. The output should look like the figure above. Written, 30 October 2012 by David W. Fanning. Added DRAWORDER keyword and fixed a typo concerning MISSING_VALUE. 31 Oct 2012. DWF. Fixed a problem that was causing floating underflow warnings to be thrown. 5 Nov 2012. DWF. Images with values between 0 and 255 were not getting scaled properly. Fixed. 30 Nov 2012. DWF. Added a FlyTo keyword to allow the user to fly to a particular location on the Earth. 31 Dec 2012. DWF. Was not handling 24- or 32-bit images correctly, nor was the MISSING_COLOR keyword being interpreted correctly when expressed as a color string. 20 Feb 2013. DWF. Have been writing the absolute path to the image file into the KML file, when I should have been using a relative path. 22 Feb 2013. DWF.